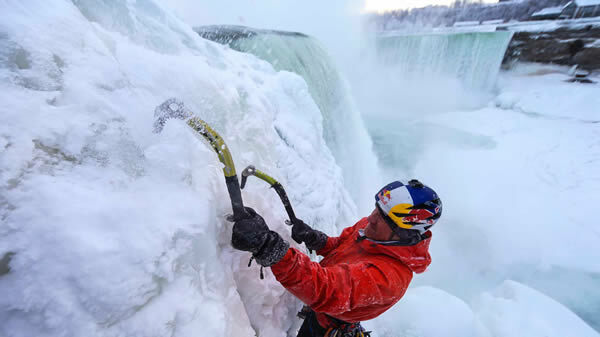 Last week, two daredevil Canadian climbers, Will Gadd and Sarah Hueniken, attempted the impossible: scaling Niagara’s 51m-high, frozen falls. And it only took them just under an hour to do it. It’s important to note that even in these three rare instances, the falls never completely froze over, making attempts to climb up the falls extremely dangerous. The water, albeit in smaller volumes, continues to flow, forming unstable layers of snow, slush and ice (see 2:08 when Gadd sinks his hooks into a piece of snow that simply crumbles away). It’s a feat we wouldn’t suggest trying at home. Still, for Gadd and Hueniken, being the first climbers to travel up Niagara Falls is a good way to go down in history. “There's only one Mount Everest, there's only one Niagara Falls and I feel really lucky because that ended a lot of hard work by a lot of people and I got to climb something to me that was really amazing and really beautiful and a whole lot of fun,” Gadd said in an interview with ABC. In the winter, videos like the above are one of the only ways to get a sense of the falls’ majesty up close. Visitors have been banned from walking on the bridges formed by the ice since 1912; it’s illegal to climb the falls on either side of the border; and the boat tour on the New York side of the Falls, the Maid of the Mist, shuts down after October because of icy conditions, usually reopening in April or May. 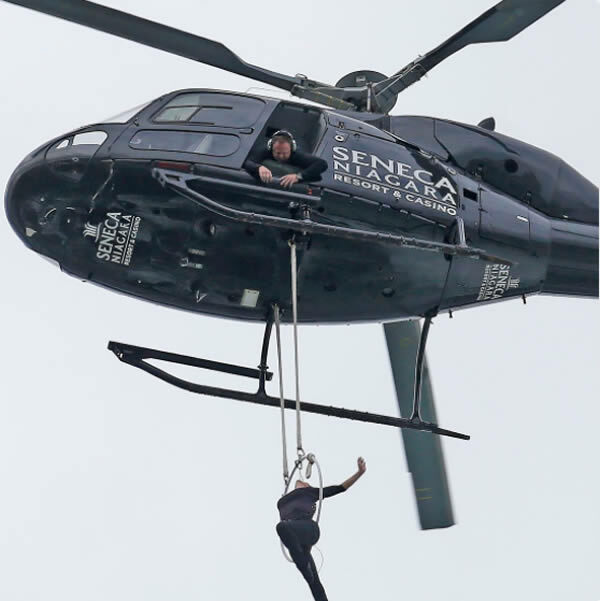 Erendira Wallenda, the wife of famed high wire artist Nik Wallenda, completed her own heart-pounding stunt today, a daring maneuver that involves hanging by her teeth and toes from a hoop dangling out of a helicopter as it flew over Niagara Falls. The aerialist stunned onlookers as she performed the record-breaking feat, telling people afterwards that the stunt was harder than she expected because of the weather. "It felt amazing. It was a little more windy than I expected it to be, but then I just put myself back in my backyard where I train all the time," Wallenda said in a press conference following her stunt. "I felt good enough to where I was able to hang by my teeth a second time." The stunt comes five years after her daredevil husband became the first person to walk across Niagara Falls on a high wire, a wildly popular achievement that was televised in in 2012. Nik Wallenda called his wife "a ballerina in the air" during a news conference Thursday detailing the stunt. Erendira Wallenda assured the public that her training had prepared her for the feat. "This is something that we train for, so I'm not just going to go out there and be like, 'Oh I hope for the best," she said. Rebecca Wydysh, a representative for the Niagara County Legislature, presented Wallenda with a proclamation to commemorate her spectacle and declared June 15 as Erendira Wallenda Day in Niagara County. "I'm just so thankful for the opportunity, so hopefully we can do something together in the next five years," Wallenda said, hinting at a future stunt with her husband. 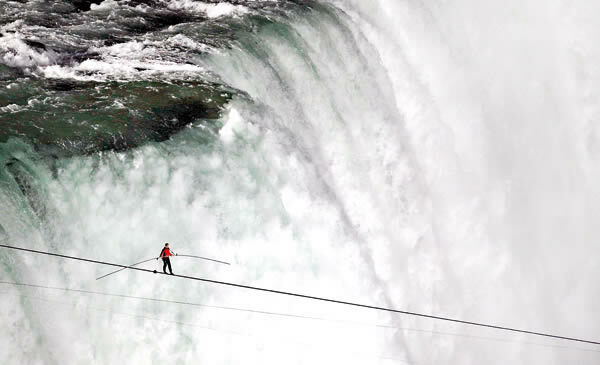 On February 15, 2012, acrobat, aerialist and daredevil Nik Wallenda received approval from Ontario's Niagara Parks Commission (NPC) to walk a tightrope across Niagara Falls, a dream he had had since he was a child. The plan called for crossing the Niagara River and its 200-foot (61 m) deep gorge from the American side at Goat Island and making his way across the river to the Canadian side near the site of Table Rock. 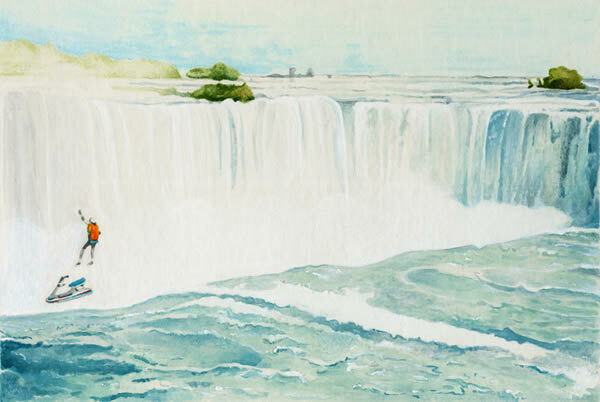 The American Falls and Bridal Veil Falls would be behind him and to his right, while the Canadian Falls would be on his immediate left and behind. The approval came after nearly two years of lobbying governments in both the United States and Canada. Wallenda's walk also brought in $3.3 million of revenue to the city of Niagara Falls, New York. 38,000 people gathered in that state to watch the action. In the summer of 1876, crowds gathered to see an Italian woman challenge Niagara. Maria Spelterini made several successful trips across the gorge on a tightrope, tempting fate by making the crossing while shackled. She walked across with peach baskets on her feet and also made the trip walking backward. 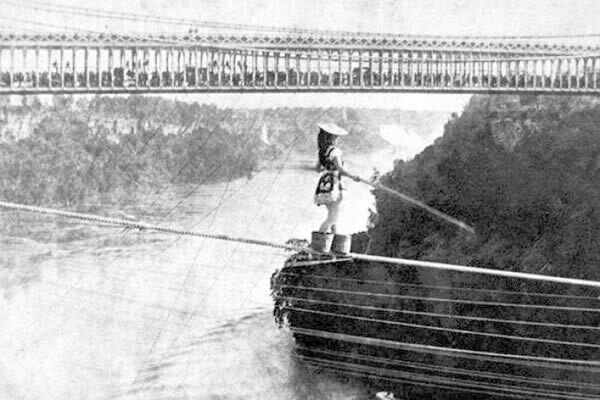 The last legal tightrope walk occurred in July of 1896. 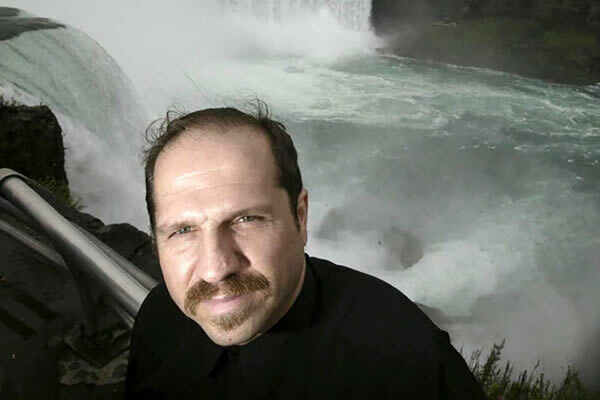 A Niagara Falls daredevil made a splash in 2003 as the first person to take the plunge with no protection. He should have called it quits then. Kirk Jones tried the stunt again on April 19 — this time in a 10-foot inflatable ball — but was killed the second time around. The 53-year-old’s body was recovered 12 miles away at the mouth of Lake Ontario on June 2, State Park Police Detective Sgt. Brian Nesbit told the Syracuse Post-Standard. His ball was picked up by the Maid of the Mist tour boat. “That’s the guy,” Nisbet said when asked whether Jones was the same man who’d survived the falls on Oct. 20, 2003, when he went over wearing only his clothes. 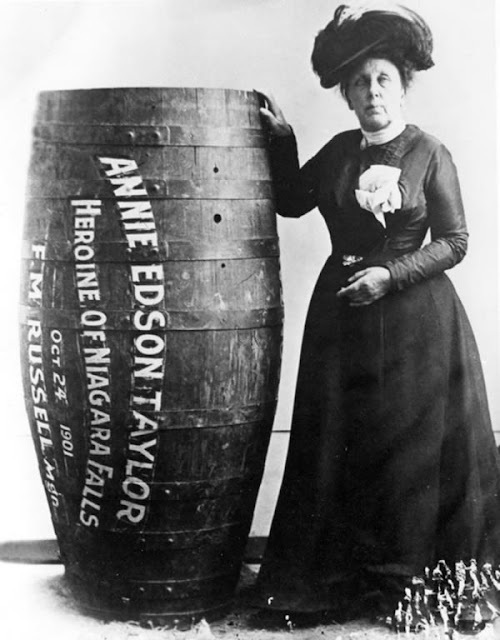 Jones “may have been attempting a stunt by going over Niagara Falls in a large inflatable ball,” Nisbet said. In 2003, the man’s family said Jones had planned his unprotected plunge as a daredevil stunt — but he initially said he was trying to kill himself, the paper reported. He broke his ribs and bruised his spine in the 180-foot fall into the Horseshoe Falls along the US-Canada border, where water rushes at 150,000 gallons a second. Canadian authorities banned Jones for life after he pleaded guilty to unlawfully performing a stunt and mischief. He was fined nearly $3,000. He described his experience in an appearance on ABC’s “Good Morning America” a week after the stunt. There’s no evidence the guide was ever published. Jones later joined a Florida-based circus as a stunt performer and had recently been living in Spring Hill, Fla. Since his 2003 stunt, three other people have survived unprotected plunges, most recently in 2012. Niagara Falls has a powerful allure, especially if you're a daredevil. Every year, it attracts people hoping to join the privileged ranks of those who have gone over the falls and survived. Back in 1995, 39-year-old California stunt man Robert Overacker hoped to join that exclusive club...until tragedy struck on his way down. On October 2, 1995, Overacker arrived at Niagara Falls to execute a stunt to raise awareness for the homeless. He planned to Jet Ski over the falls on the Canadian side, deploy a parachute, and land safely. 0 Response to "7 Awesome Niagara Falls Stunts"